PURPOSE: Posterior staphyloma is an ocular complication associated with high myopia and reflects degenerative changes on the sclera. Its morphology is associated with chorioretinal atrophy and myopic maculopathy. The purpose of this study was to validate the efficacy of optical coherence tomography (OCT) in providing a simple estimation of the staphyloma pattern. MATERIALS AND METHODS: Observational case-series study of high myopic patients with posterior staphylomas. Patients were examined using the star scan pattern OCT in different radial planes. Three-dimensional (3D) magnetic resonance tomography was also performed to visualize the anatomical characteristics of the posterior pole. 3D-segmentation and curvature analysis were also performed. RESULTS: Eight patients were totally enrolled in this pilot study. Our study pool consisted of 2 wide macular staphylomas, 2 narrow macular staphylomas, and 4 barrel-shaped staphylomas. Our preliminary results revealed that patients displayed mirror-image distortion in the steeper staphyloma axis. In the barrel-shaped subtype, no image distortion was displayed in any plane. CONCLUSION: We estimated the axis of the smaller base curvature by noting the distortion pattern in the different radial axis. The recognition of pathologic axial myopia is important since there is a risk of permanent vision loss from vision to threatening sequelae. The prevalence of myopia has increased dramatically over the last decades. It is estimated that there will be approximately 1 billion high myopes (<5D diopters) globally by 2050. Several ocular complications are associated with high myopia such as glaucoma, myopic maculopathy, retinal detachment, and posterior staphyloma. The latter, defined as a localized protrusion in the posterior ocular wall, is a characteristic deformity of eyes with pathological myopia. Staphylomas were reported to be present in 90% of a group of 209 high myopic eyes. A higher prevalence of staphyloma is associated with increased axial length and advanced patients' age. The deformity of the globe is associated with thinning of the sclera and the choroid and may facilitate the development of macular pathologies such as choroidal neovascularization (CNV), chorioretinal atrophy, or myopic traction maculopathy. The prevalence of macular atrophy is higher in macular staphylomas compared to other types of staphylomas. 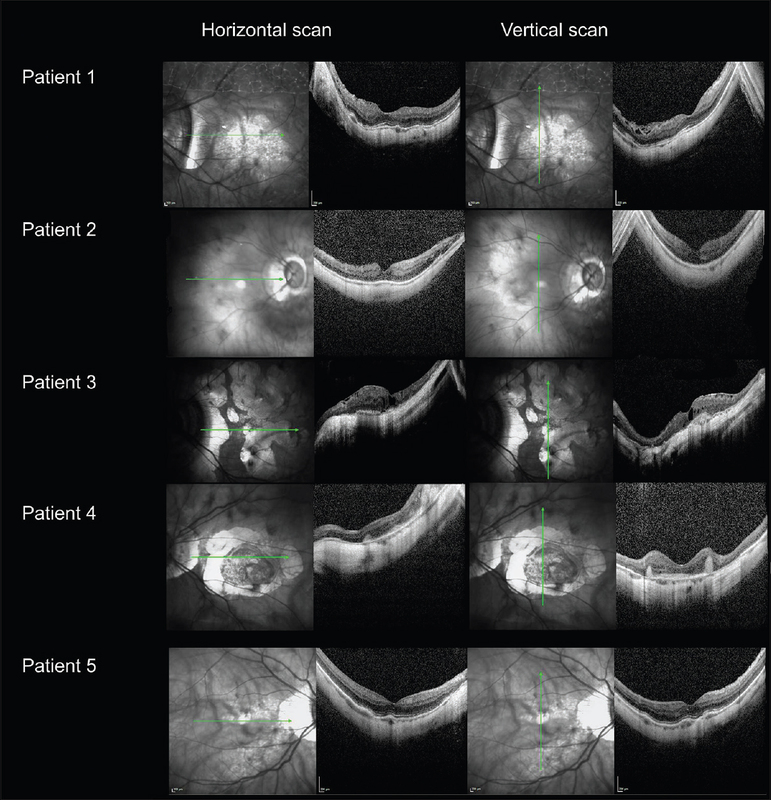 Optical coherence tomography (OCT) has become an integral part of the ophthalmological examination in high myopes, by enabling noncontact in vivo visualization of retinal structures. However, due to the special characteristics of myopic eyes, OCT images occasionally suffer from distortion that affects their ability to accurately represent the shape of the eye. A common distortion is the mirror-image artefact. This artefact arises from the Fourier transformation used in systems with Fourier-domain detection. The artefact occurs due to a complex conjugate ambiguity of Fourier-transform of real-value spectral data. Typically, commercial instruments truncate one side of the OCT image, and the remaining half is displayed. The technique works when the retinal image lies solely on one side of the 0-delay position. However, when the retinal image crosses the 0-delay line, the symmetric mirror image in the truncated side crosses into the scanning range of the displayed portion of the OCT image. Thus, the OCT image appears to fold onto itself, and the overlapping images produce the mirror-image artefact. In myopic eyes with a deep staphyloma, this artefact adversely affects images such that in one section, half of the image is upright and the other half is inverted. Furthermore, it is noticed that the deeper the staphyloma, more distortion is caused in the cross-sectional images. Studies have suggested that macular bulging is elongated mostly along a main horizontal plane, thus, better captured by vertical OCT scans. This observation suggests that depending on its asymmetry, the posterior pole of the eye in different staphylomas can be better visualized with OCT by assessing a specific plane orientation. 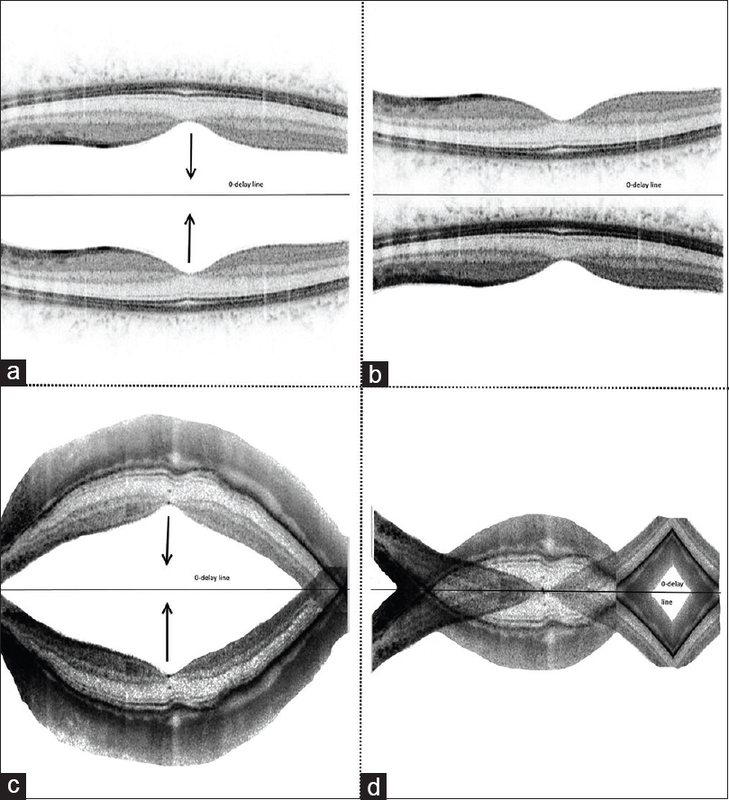 A steeper scleral wall along the OCT section axis would be prone to segmentation errors because of the retinal image placement around the 0-delay position. An explanation is illustrated in [Figure 1]. Currently, there is no simple imaging technique that helps identifying the geometry of a staphyloma. The purpose of this study was to test the hypothesis that OCT scanning in different plane orientations is a simple way to obtain a rough estimation of the staphyloma morphology. The presented study was conducted using OCT and magnetic resonance imaging (MRI) tomography for the enrollees. This observational case-series study included patients referred to the Retina Department of University Hospital of Heraklion, Crete, Greece. The study was approved by Local Ethics Committee and adhered to the tenets of the Declaration of Helsinki. The purpose of this study was explained to all participants who gave signed written consent. From a pool of 61 total patients, 19 patients were diagnosed with macular staphyloma using indirect ophthalmoscopy and were referred for further evaluation with OCT and MRI. 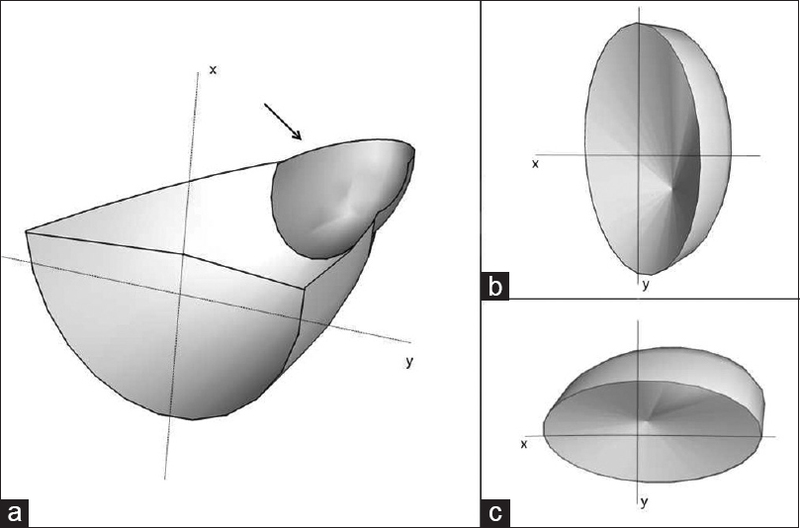 Eligible for analysis were adult high myopic patients, of no less than −6.00 D in spherical power, with simple staphylomas with only one additional curvature. Patients with previous intraocular or refractive surgery as well as severe systemic conditions were excluded from the study. For the purpose of this study, eight patients (five females and three males) fulfilled the inclusion criteria and were further analyzed. Of the enrolled patients, two patients displayed distorted images on horizontal plane only, two patients had distorted images on the vertical plane only, and four patients had no distortion at either plane. To evaluate the morphological characteristics of the posterior pole, three-dimensional (3D)-MRI was performed in all eight cases. Staphylomas were evaluated using the Spectralis spectral domain-OCT (SD-OCT) (Heidelberg Engineering, Heidelberg, Germany). The macular star scan pattern was applied [Figure 2]a. 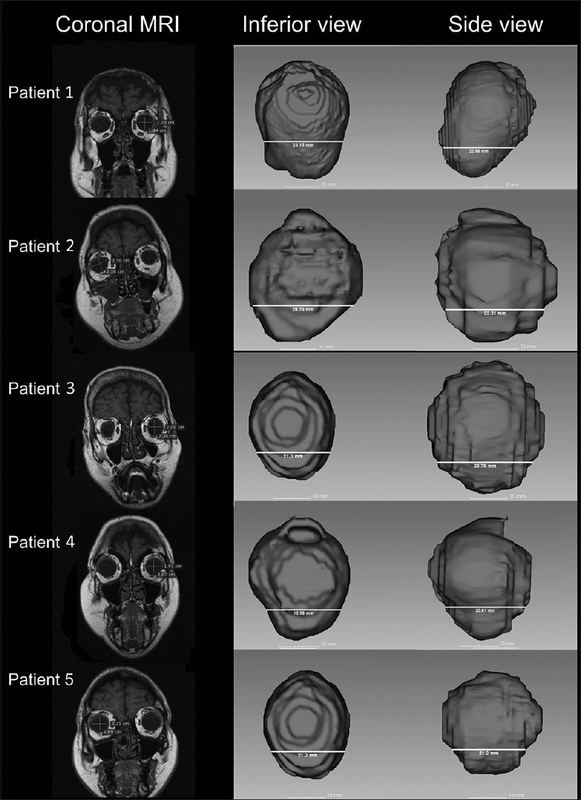 Each scan consisted of 6 radial B-scans, and each radius scan differed from the previous by 30° of sloping. MRI was performed using a clinical 1.5T whole-body superconducting imaging system (MAGNETOM Sonata/Vision, Siemens Healthcare, Erlangen, Germany), equipped with high performance gradients (Gradient strength: 40 mT/m, Slew rate: 200 mT/m/ms) utilizing a standard circular polarized body coil as a transmitter and a linear polarized head coil as a receiver. The comprehensive HR-MRI protocol consisted of one 3D T1w sequence ([3D-VIBE] [volume interpolated breath-hold examination]) and one 3D (T2/T1) w sequence [(3D-CISS) (constructive interference on the steady state). The participants were instructed to keep both eyes closed with minimal movement during the scanning. The image resolution voxel was 1 mm × 1 mm × 1 mm. The typical scanning time for each participant was approximately 11 min. Of the eight patients, four patients displayed mirror-image artefact only in a certain axis and four patients displayed no distortion in either plane. OCT images at the horizontal and vertical plane are illustrated in [Figure 3]. Patients 1 and 2 revealed mirror-image distortion in the vertical plane while no artefacts were noted in the horizontal plane. Patient 3 and patient 4°CT images were significant for mirror-image distortion in horizontal planes only. In patient 5–8, no segmentation errors were revealed in any axis. Patient 5 is illustrated as an example in [Figure 3]. MRI demonstrated the 3D eyeball anatomy. Although images from patients 1 and 2 showed a wide area of protrusion when viewed from inferiorly, when displayed nasally, the size of outpouching was asymmetrical. The finding suggests that the staphyloma is irregularly shaped and narrower vertically. For patient 3 and patient 4, it is revealed that their staphylomas were narrower horizontally. A coronal plane image at the basis of the staphyloma is also shown for every patient in [Figure 4]. The 3D segmented volumes are also documented in [Figure 4]. Ocular shapes were identified dynamically from the rotating view both horizontally and vertically. Patients 1–2 had a wide macular staphyloma type, with a wide horizontal base, while patients 3 and 4 had a narrow macular staphyloma with a narrow base. Patients 5–8 displayed staphylomas of equal dimensions, which manifested such as ellipsoidal and barrel-shape staphylomas. In all cases of asymmetrical staphylomas, MRI mirror images happened when scanning the narrower dimension of the staphyloma, as shown in [Figure 4], while no mirror image was seen in either of the symmetrical staphylomas. The shape of the eye in myopia was initially assessed based on ophthalmoscopic observation and fundus drawings by Curtin, who first classified the morphological aspects of the posterior staphyloma in ten different types. Currently, changes in the myopic globe can be determined in terms of imaging by ultrasound and MRI. While ultrasound is not suitable for accurate quantification, posterior staphylomas have been quantified by 3D-MRI. Ohno-Matsui also described five types of posterior staphyloma based on the analysis of the outer border of the staphyloma. She found that the most common types of staphylomas where the “narrow” and the “wide” macular ones. Posterior staphyloma was defined by Spaide as “the ectasia of a limited portion of scleral wall with a radius shorter than the radius of the curvature of the surrounding area.” It had been found that the mean best-corrected visual acuity was significantly better in eyes without a staphyloma than in eyes with any type of staphyloma; moreover, eyes with staphyloma have greater incident of CNV. The wide macular distortion pattern staphyloma, one of the most prevalent types in older age, has been recognized by asymmetrical enlargement temporally and inferiorly. This type is also recognized as the most associated with diffuse chorioretinal atrophy. Moreover, in another recent cohort study, it was found that myopic maculopathy was uncommon in a spheroidal eye shape, whereas more than 75% of the distorted eyes had myopic maculopathy. Ohno-Matsui proposed that during the development of staphyloma, ectasia expands mostly toward the inferior part of the eye. The scleral tissue is weaker in the inferior area than in the other areas of the eye, probably due to the fact that the inferior part of the eye is the area of the closure of embryonic ocular fissure. Finally, the sclera protects the ocular neural tissues (the neural retina and the optic nerve) from mechanical insults. Thus, it is reasonable to hypothesize that a deformity of the eye by a staphyloma may result in mechanical damage. MRI provides a complete 3D-representation of the eye free of optical distortions. However, the examination is time-consuming, and most importantly, there are logistical and financial barriers to readily obtain MRI images on a routine basis. Moreover, MRI is contraindicated in specific patient groups, like patients suffering from claustrophobia or with implanted permanent pacemakers. Therefore, the current application of MRI to determine the posterior eye shape is primarily left for research purposes. Developing alternative techniques to MRI would make a measurement of posterior eye shape more accessible to both researchers and clinicians and would facilitate the understanding of the structural changes in pathologic myopia. OCT, since its implementation, has made it possible to visualize changes in ocular layers as myopia progresses. Several retinal pathologies have been explored, such as retinoschisis, intraretinal cysts, lamellar holes, macular holes, and choroidal neovascular membranes. Fourier-domain OCT detection is performed in two ways: SD-OCT with a spectrometer and a line scan camera or swept-source (SS) OCT with a rapidly tunable laser source. OCT scans are represented as flat transverse slices through the retina. These are compared pixel-to-pixel with simultaneous confocal images to identify structures on the posterior pole. Inevitably, this transformative approach hinders image artefacts and distortions. Distortion-corrected OCT images had been successfully correlated to MRI images when measuring the posterior eye shape. The researchers compared the spherical radius of curvature measured by both the OCT and MRI. The results were promising but are currently limited to post-processing analysis. Our study sample displayed patients with asymmetrical inferior and temporal profiles. We successfully estimated the smaller base curvature radius in patients 3 and 4 by interpretation of the distortion pattern in the different radial axis. Similarly, for patients 1 and 2 mirror-image artefacts were shown only in vertical sections. The height of the staphyloma, as measured in the 3D-MRI was found to be smaller than its base in those last two cases. The mirror artefacts are often recognized in high axial myopia, where image processing causes a peripheral breakdown in segmentation. The 0-delay line is normally placed in front of the macula using a fixation target where the patient focuses. However, peripheral curvature causes the retina to cross the 0-delay line. A greater curvature would render a bigger part of the retina further of the 0-delay line, thus forcing it to fold over itself. How this crescent-shaped defect is generated in high myopia is illustrated in [Figure 5]. In simple terms, based on our observation, one can assume that the presence of single-sided mirror image in highly myopic eyes indicates the presence of asymmetrical staphyloma and more specifically the presence of a staphyloma possessing the narrowest dimension of its basis on the axis that the mirror-image appears. However, it should be noted that, despite the promising application of our observation, the slope limits and the staphyloma depth where mirror-image distortion occurs need to be determined in a larger patient pool. Moreover, it is important to notice that in addition to myopic staphylomas mirror-image artefacts have also been observed in cases of eccentric fixation or elevated choroidal nevi. In our study, only SD-OCT was applied. Nevertheless, SS-OCT better images the staphylomas by scanning a larger area of the posterior fundus. In addition, MRI itself can be subject to inaccuracies. Geometric distortions in MRI images result from magnetic gradient field nonlinearities and magnetic field inhomogeneities., Gradient field nonlinearities create increasing distortions away from the gradient isocenter of the MRI coils. It is also important to note the eye shapes identified from the T2-weighted MRI actually represent the contour of the intraocular fluid rather than the external eye surface that is the sclera. In this work, we present a simple screening method to assess the irregular dimensions of a posterior staphyloma based on Fourier-domain OCT analysis. The presence of a single-sided mirror-image artefact is useful to identify the asymmetry of a staphyloma on the scanned plane. The proposed methodology could be used to identify eyes with a higher risk for the development of myopia-related pathologies, such as myopic maculopathy. Holden BA, Fricke TR, Wilson DA, Jong M, Naidoo KS, Sankaridurg P, et al. Global prevalence of myopia and high myopia and temporal trends from 2000 through 2050. Ophthalmology 2016;123:1036-42. Verkicharla PK, Ohno-Matsui K, Saw SM. Current and predicted demographics of high myopia and an update of its associated pathological changes. Ophthalmic Physiol Opt 2015;35:465-75. Ohno-Matsui K, Lai TY, Lai CC, Cheung CM. Updates of pathologic myopia. Prog Retin Eye Res 2016;52:156-87. Frisina R, Baldi A, Cesana BM, Semeraro F, Parolini B. Morphological and clinical characteristics of myopic posterior staphyloma in Caucasians. Graefes Arch Clin Exp Ophthalmol 2016;254:2119-29. Ho J, Castro DP, Castro LC, Chen Y, Liu J, Mattox C, et al. 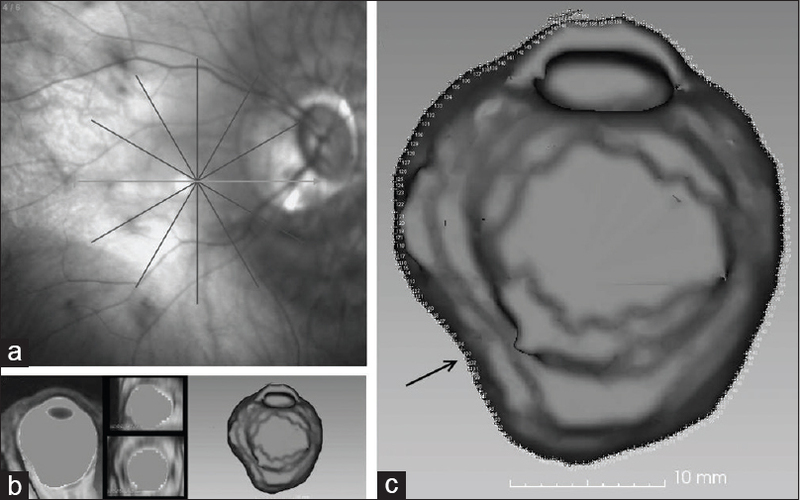 Clinical assessment of mirror artifacts in spectral-domain optical coherence tomography. Invest Ophthalmol Vis Sci 2010;51:3714-20. Faghihi H, Hajizadeh F, Riazi-Esfahani M. Optical coherence tomographic findings in highly myopic eyes. J Ophthalmic Vis Res 2010;5:110-21. Ohno-Matsui K. Proposed classification of posterior staphylomas based on analyses of eye shape by three-dimensional magnetic resonance imaging and wide-field fundus imaging. Ophthalmology 2014;121:1798-809. Moriyama M, Ohno-Matsui K, Modegi T, Kondo J, Takahashi Y, Tomita M, et al. Quantitative analyses of high-resolution 3D MR images of highly myopic eyes to determine their shapes. Invest Ophthalmol Vis Sci 2012;53:4510-8. Spaide RF, Ohno-Matsui K, Yannuzzi LA. Pathologic Myopia. New York: Springer; 2013. p. 177-85. Moriyama M, Ohno-Matsui K, Hayashi K, Shimada N, Yoshida T, Tokoro T, et al. Topographic analyses of shape of eyes with pathologic myopia by high-resolution three-dimensional magnetic resonance imaging. Ophthalmology 2011;118:1626-37. Guo X, Xiao O, Chen Y, Wu H, Chen L, Morgan IG, et al. Three-dimensional eye shape, myopic maculopathy, and visual acuity: The zhongshan ophthalmic center-brien holden vision institute high myopia cohort study. Ophthalmology 2017;124:679-87. Bontzos G, Plainis S, Papadaki E, Giannakopoulou T, Detorakis E. Mechanical optic neuropathy in high myopia. Clin Exp Optom 2018;101:613-5. Drexler W, Fujimoto JG. State-of-the-art retinal optical coherence tomography. Prog Retin Eye Res 2008;27:45-88. Kuo AN, Verkicharla PK, McNabb RP, Cheung CY, Hilal S, Farsiu S, et al. Posterior eye shape measurement with retinal OCT compared to MRI. Invest Ophthalmol Vis Sci 2016;57:OCT196-203. Sumanaweera TS, Adler JR Jr., Napel S, Glover GH. Characterization of spatial distortion in magnetic resonance imaging and its implications for stereotactic surgery. Neurosurgery 1994;35:696-703. Wang D, Strugnell W, Cowin G, Doddrell DM, Slaughter R. Geometric distortion in clinical MRI systems part I: Evaluation using a 3D phantom. Magn Reson Imaging 2004;22:1211-21.